An asset in any industry...de-slagging, de-sputtering welds, cleaning, castings, brick, stonework, and other materials. 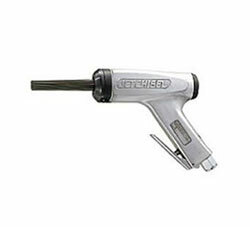 Jet Chisel is a prime pneumatic perfomer in each of these and other tough job areas. Maximum performance in a light-weight, minimumsize air tool, Jet Chisel delivers years of trouble-free, efficient operation. And it's a tool that gets all the way down to the surface of matters. Quick, Jet Chisel needles adjust to any surface contour automatically. They get deep into corners, all the way into uneven surfaces, all types of curvatures making it a tool no shop should be without. It's an equally efficient time-saver in ship-board applications, too.